For Take It or Leave It, Andrea Fraser expanded her 1990 work Notes on the Margin. Adopting the form of the museum wall text, the work consists of fifteen labels (the original version had seven) interspersed throughout the exhibition. 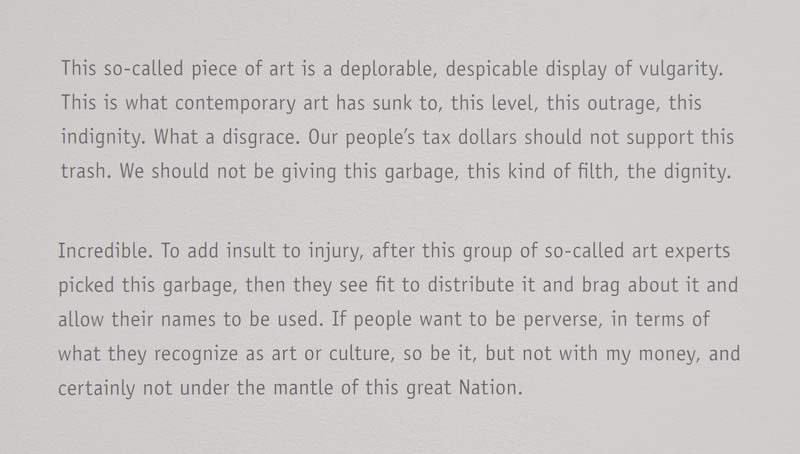 Originally created for an eponymous exhibition at Gracie Mansion in New York City, several of the texts are appropriated from statements made by US senators and congressmen, such as Senators Jesse Helms and Charles Grassley, who advocated censorship and the reduction of government funding for the National Endowment for the Arts in 1989. "Notes on the Margin." Take It or Leave It: Institution, Image, Ideology Digital Archive. Los Angeles: Hammer Museum, 2017. https://​hammer.ucla.edu/​take-it-or-leave-it/​art/​notes-on-the-margin/​.